I use Adobe Photoshop CS4 software to design my graphic, but far less expensive programs like Adobe Photoshop Elements would certainly be sufficient. Graphics software that offers several font choices, font size, rotation and letter spacing changes is essential to the process. Saving your artwork/lettering in .PNG format is often a good choice due to it's lossless resizing capabilities. After printing my initial artwork I can check it against the peghead to determine whether the size and spacing is suitable. Before printing the actual decal I have usually printed several samples and a variety of sizes. My final design is then printed on Clear Inkjet Decal Paper using an ordinary inkjet printer. Inkjet printer? Yes. The trick is to overspray the printed decal paper with Clear Lacquer Spray Paint after printing. This seals the ink and makes it waterproof...skip this step and you'll have a runny mess on your hands once the decal is immersed in water! The first coat I apply is quite thin to insure the lacquer does not cause the printer ink to bleed or run. We call this a "dry coat". The can is moved quickly and applied rather dry. After allowing that time to tack up I apply one or two more coats to insure it is completely covered and ready for soaking. It's just like applying a model car decal. Once the decal is immersed in water it will loose it's grip on the paper, this permits you to slide it off of the decal backing and onto your peghead. Position it as quickly as possible. You can add additional drops of water to float the decal and aid in placement but excess watering and repositioning can eventually remove the glue from the back of the decal. After the decal is in place, cover your fingertip with a paper towel and pat it gently in an up and down motion to flatten it out. Avoid dragging your fingertip back and forth across the decal as are likely to move or tear it. I perfer to roll my finger from side to side, similar to taking fingerprints. Once the bubbles are removed and it is laying flat, let it dry. Many manufacturers apply their finish over the peghead decal. It's important to keep in mind that if you desire to overcoat the peghead and decal you must insure the paint you are using will adhere to the original finish used on the instrument. Before applying the decal, the surface should be prepared for overspraying if that is your intent. 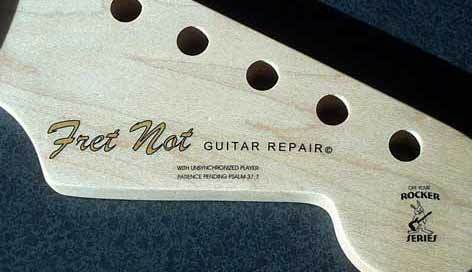 Guitar ReRanch offers many articles pertaining to refinishing musical instruments.